The cover of the book is like the wrapping on the package—except it’s permanent. It needs to convey something essential about the story within—mood or themes or a moment or all of the above—without giving anything big away. Most of all, it should spike curiosity. Why this cover? What’s the significance of this image and what is it trying to tell me about the story I’m going to find inside? The initial concept for the cover of Never Break the Chain zeroed in on one of the elements of the story that carries over from Believe in Me — the one photo of his mother that Tim Green has ever seen, taken by his father at a Bob Seger concert on New Year’s Eve, the night his parents met. After producing that image and starting to work on type treatments, cover artist Jean-Paul Vest and I ran into an unanticipated issue. No matter how we treated the image—a black-and-white shot of Tim’s mother dancing in the aisle at the concert, mid-twirl, chin raised and hair flying—the subtextual message the image insisted on conveying to the audience was “romance novel.” Not what we were going for! Fortunately, it didn’t take long to figure out an alternative approach that would incorporate that image without making it the entire cover. Instead of just the image of Tim’s mother, the cover zooms its field of vision out a step farther to offer a Tim’s-eye view of his obsessive effort to track down his mother while at the same time working up a biography of his new employers, a band called Empire. Every single element of the cover is a reference to something that happens in the story, whether a throwaway line or a major plot point, and the crowdedness and intensity it conveys reflects Tim’s mental state as he juggles both commitments and obsessions. In that spirit, an invitation: interview me. If there is anything—anything at all—that you’d like to know about the new book, the process of writing it, the process of self-publishing it, either of my previous books, or anything else “authorish” that you’re curious about, please send me your questions—the sooner the better, but in any case no later than this Friday, August 18. The completed interview will publish early next week. 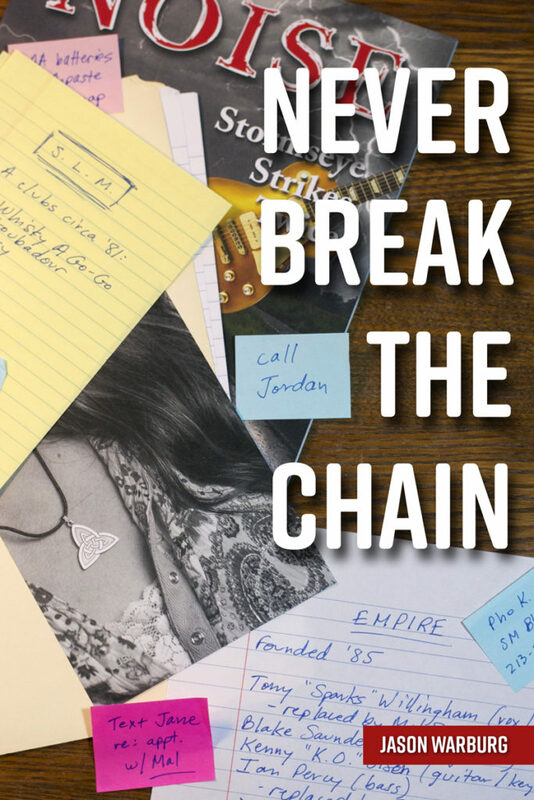 Subscribers to our newsletter will be automatically entered in a drawing for one of three signed copies of Never Break the Chain. Winners will be announced August 31. Sign up at the bottom of this page, and tell a friend! Publication day is September 5. Until next week, be good, and do good. See you soon.